Scroll down for a history of this very successful program. 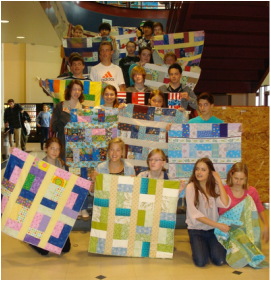 The students at Rutland Secondary School made baby quilts. "This year we had 16 students making quilts at RSS. A few of them had made one last year, but for the most part the students were brand new to quilting. They had a wonderful time learning from and working with the volunteers. This year was extra special as one of our staff member's grandsons received a blanket made by RSS students. Having someone so close to us receive our blankets really helped students feel like their work was making a difference for families. Thanks again to the wonderful volunteers for donating the time, skills and knowledge!" As always it was such a delight to have the Orchard Valley Quilters Guild's outreach program come into to our Fashion and Sewing 9 class. The level of expertise, patience and creativity of its members is always admired and appreciated by myself and my students. This year was a truly a special year, as we had a neo-natal quilt recipient in the Fashion & Sewing 9 class and were able to connect the now 15 year old student and their mom with the maker of her quilt. It was a really special moment for both the quilter, the student and my class to see how cherished these quilts are by their recipients. The neo-natal quilt project is practical in skill development, meaningful to its real life application and charitable in that it gives back to the community. Many thanks for the many quilters who volunteer their time and energy into this beautiful project. Thank you to all the Outreach volunteers who did Show and Tell for the class and assisted in the completion of these wonderful donations. My first-time students are always hesitant when they hear we are making baby quilts. However, by the end of our first day with the quilters guild members, they understand why my returning students always want to make a quilt for the second time. The volunteers are always so kind and patient with the students as they learn. They share stories, wisdom and examples of their own beautiful work. My students always enjoy building the quilts and are often inspired to make their own. It is a wonderful program and we look forward to having them join us again next year. 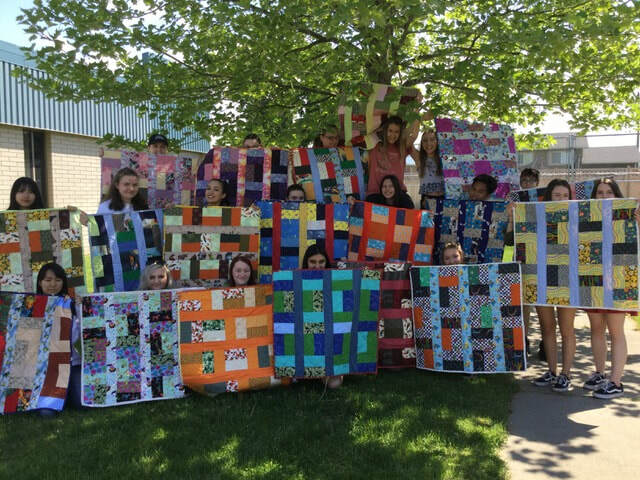 Here is a photo of the Mount Boucherie Secondary School textiles class which has just completed 17 quilts for the Neonatal Intensive Care Unit (NICU) at Kelowna General Hospital. This introduction to quilting was a first time experience for the students and allowed them the opportunity to learn a new skill and also to donate to their community. ​Working with Mrs. Geistlinger's class was a pleasure and we look forward to another session in the fall of 2018. Thank you to all the Outreach volunteers who did Show and Tell for the class and assisted in the completion of these wonderful donations. 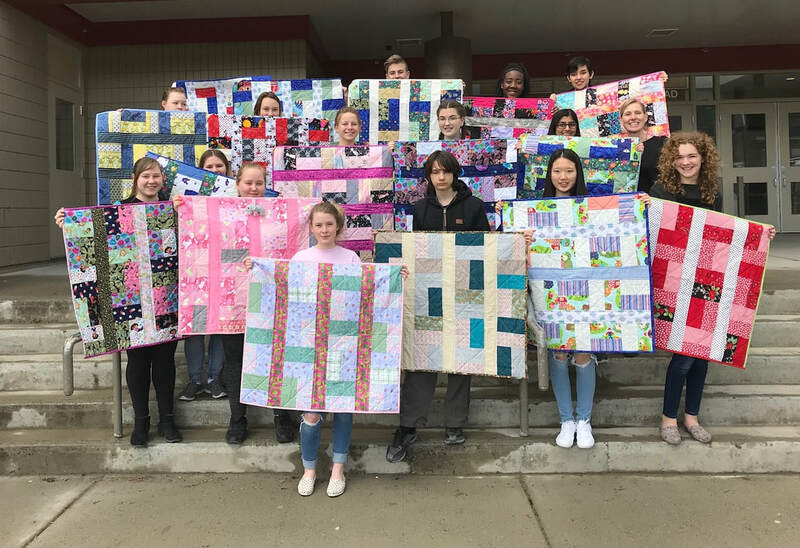 At our most recent session at Mount Boucherie Secondary School, students produced 24 quilts which were presented to the Salvation Army to assist young mothers and families of limited resources at Christmas time. Working with the Orchard Valley Quilters Guild was such a delight. The members were so giving with their time, energy and knowledge. Each day several of the members brought in their work to show the students the limitless possibilities that quilting can provide. My students and I were awed and inspired by the artwork and talent of the Orchard Valley quilters. As a teacher it was wonderful having so many of your members in the classroom helping and supporting the students, and it allowed all my students more one on one time as they work through the various steps of building a quilt, giving the students confidence in their work. The quilts turned out beautifully and many of the parents have told me they wished the quilts were coming home as they look so gorgeous in the photos. But to me the true testament to how successful the program is, is the legacy of quilting they have given to my students. In fact one of my students enjoyed quilting so much that before she finished her neonatal quilt in class she had started a quilt for her aunt at home. And a second student requested I start a quilting only class to explore the many ways to quilt. This to me speaks to how the Orchard Valley Quilters reached my students through this art form. Many thanks! A big thank you to all of the women who came to Mount Boucherie, not just this spring, but over the past many years. I am retiring from teaching this June and can say I will dearly miss this special project my students have done with you each year. Continue to do the wonderful work you do making a difference in our youth! They love the connection they make with each of you. You provide them with valuable history, skills, and a connection to the community. For some of them, this may be the one and only time they quilt, but for many of them, you have sparked an interest that they will likely keep for their lifetime. They will always remember this experience you have provided for them. So, as I ride into the sunset, sewing machine in hand, I wish you all the best in your continued efforts to share your passion for an age-old skill to our grateful students. Hope to see you some time in the future! Another successful high school session, this time at Rutland Secondary School, complete. We had great fun even through it was a small class. When asked “Would you take the quilting class again?” all the students said, " YES!" They had learned a lot and had fun at the same time. First time, the teacher Pam Bruder made a quilt to donate. Two books were donated to RSS for their sewing library. Once again, the wonderful ladies of the Orchard Valley Quilters Guild in Kelowna volunteered their time to come to my classroom and teach my Grade 10 students at Mount Boucherie Secondary School the age-old art of Quilting. The ladies of the OVQG spent 5 classes – a total of 13 hours - teaching my students about quilting, including the history of the art, showing beautiful samples of their quilting expertise and providing a kit for each of my students so they could make their own baby quilt. The ladies of the guild donated all the fabric needed for the quilts. The kits were ready to assemble as all of the pieces were pre-cut by the women allowing my students to get right to it! The ladies taught the students about colour and design as they each arranged their fabrics into beautiful and original quilts. They showed the students tricks on how to sew and press the blocks and gradually the top layer of their quilts emerged. The students learned how to layer the batting and a base layer with their blocked top layer and then they “quilted” the layers together in a stitching pattern of their choice. After some trimming, the students then attached binding to the entire edge of the quilt and finished it off with a hand written label in the corner, which they hand stitched neatly in place. The finished quilts did not go home with the students, however! They were delivered to the Neo-Natal Unit of Kelowna General Hospital where they find homes with premature babies and their families. This “Outreach Program” is a wonderful program uniting the Community with the Schools. Students not only learn an age-old skill, but they develop their charitable side as well. Students love that they are supporting the community by supplying needy families with a gift they spent hours creating. It is wonderful that the Orchard Valley Quilter’s Guild is encouraging and modeling civic responsibility by donating their time and resources and sharing their valuable skills with the youth of Kelowna. Nine beautiful quilts created by Grade 10 students at Mount Boucherie Secondary School in April. Below are some pictures of Mrs. Trevor-Smith and her 15 and 16-year-old students at Okanagan Mission Secondary School. Working with our Outreach coordinators from the Orchard Valley Quilters Guild during the month of February, the students, most of them first-time sewers, produced 12 baby quilts, learned some valuable skills and had a lot of fun. At each of the 5 class sessions, the quilters did a presentation for the students and at the end of the program donated 2 books to the class for reference material. The students and the teacher now save all their sewing scraps for us to recycle rather than putting them in the garbage. 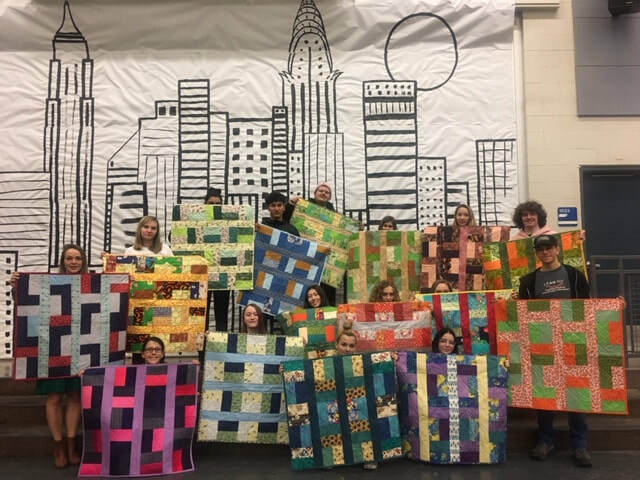 In 2012, the organizing committee of our 30th Anniversary Quilt Show decided to do something daring and launched an Outreach Project to several local high schools. Not only did we want to look to our past of thirty years but we wanted to look to our future: the next generation of sewers. Our goal was to inspire young people to discover the joys of quilting while giving to the community. Each year the OVQG gives hundreds of quilts to various organizations and groups within our city of Kelowna, BC. We felt the preemie quilts which we donate to the Neonatal Intensive Care Unit (NICU) of our local regional hospital would be a perfect match for the students as the quilts are small and adaptable to simple patterns. We also believed that quilts for premature babies would appeal to the students. The project required a lot of advance planning and preparation. Four months before the beginning of the first classes in the fall semester of 2011, contact was made with our school board to get permission to email the teachers in the high school about our idea. Eight schools were approached and five responded to our offer to provide all the materials and instruction to make a small quilt. Originally it was estimated that a total of 282 students would participate during two semesters of the 2011-2012 school year. We then decided that they would work in pairs to keep the supply list reasonable. Letters were sent to all the quilt stores in the area for donations of fabric and they generously gave enough fabric for 150 quilts! Without the help of Cottage Quilting, Fabricland, Linda’s Quilt Shoppe and Tyjo’s , it would have been very difficult to meet this need. As it was, we decided to have a Christmas raffle to fund the cost of the batting. Usually the guild provides batting for donation quilts, but this year we also needed to give over 100 larger quilts to the Rotoplast Mission which provides pediatric plastic surgery to correct cleft palates in children from Central America. Upon consultation with the school teachers, simple patterns were picked that required no matching of seams for the beginners, and more advanced patterns for the seniors. Lesson plans, instructions and quilt assembly diagrams were emailed for photocopying by the school. Then the guild formed quilt cutting bees where our members cut and packaged the kits into Ziploc bags. Although the students were paired for the quilts, each one of them also received a strip set to practise their quarter inch seams. The teachers were very excited about the program and looked forward to the help and expertise of our guild members. There was a good mix of girls and boys in the classes with the boys surprising everyone with their work. Two guild volunteers were required for each course for a proposed 8 hours of classroom instruction. Although a few classes required more time, this proved to be a reasonable expectation in spite of some schools having a one-hour class and others having a two-hour class. Learning outcomes were set as: able to sew a quarter inch seam, able to complete quilt within class time, basic understanding of importance of colour value, basic understanding of layout designs, and basic understanding of labelling. We also gave two small trunk shows: one at the beginning to whet their appetites and one at the end to inspire them to greater things. Feedback from the students, the school teachers and our guild teachers indicate that the program was a success. Kudos go to the students and the teachers for supporting this project and a standing ovation goes to our members who taught them. We heard stories from the teachers about how some students have now chosen a quilt as their senior project for the year while others from different classes were heard saying they want to do a baby quilt too! One pastor from the Christian School brought the quilt his son received and pictures of his baby in the NICU. He told the students how they take that quilt everywhere with them and how much it means to his family. His speech had a real impact on the class. A display of these quilts, with pictures of the process, was given a place of honour during our Flirty Thirties Quilt and Fibre Art Show in 2012. The program was such a success that it has continued every year since. To date, several hundred preemie quilts, made by local high school students, have been donated to the NICU at Kelowna General Hospital. Parents of babies admitted to this unit are given a choice of quilts. That quilt serves to identify their baby's incubator at a glance and travels home with the family when the baby is discharged, becoming a special memory for the family. The Orchard Valley Quilters Guild is pleased sponsor this Outreach Program and we encourage other guilds to teach the students in their communities about the timeless art of quilting. They say it takes a village to raise a child, and our guild can be proud of its work. -- Article contributed by Joan Lailey.